Tale of the new "new" laptop! - Time for a nice cup of tea? 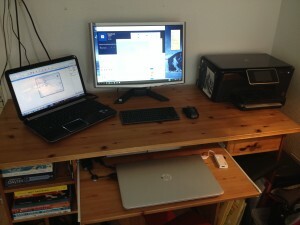 Tale of the new "new" laptop! After a failed attempt to upgrade my laptop last year (was missold a laptop, then sold it on again), I finally have a new laptop running windows 10. 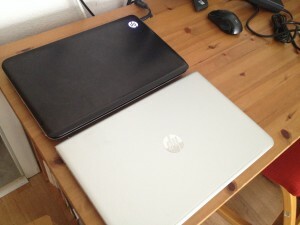 I have had my trusty black HP Pavilion five years now (I bought it 3 days before Patrick's arrival!). The old laptop is so noisy that Alan has banned me from using it in the living room ("it sounds like a plane taking off!") and half the letters have rubbed off (helped me to finally learn to touch type) and the corners have chips taken out of them and it overheats madly. BUT I loved it! Here's the unpacking of the new one, 1TB hard drive, with 250GB of HDD, backlit keyboard, shiny and silver and quiet. I have spent all day setting it up (in stages) and I still have to move over the data!